The Clarity adjustment in Lightroom can improve contrast in the midtones of an image. 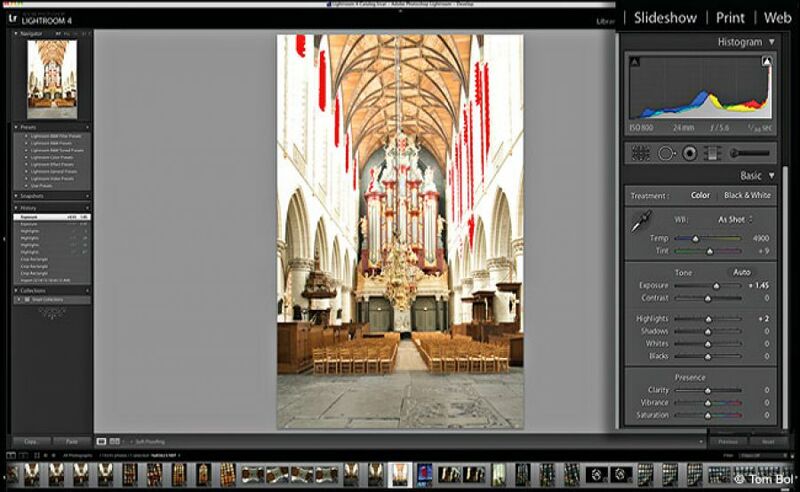 Many applications have modes that will show you highlights that are overexposed. In Lightroom, highlights show up as red areas. I evaluate the blown-out highlights and determine if I need to use the Highlights slider to tone them down. Some highlights like rim lighting or blown-out skies in portraits are deliberate choices for effect, so I leave these highlights alone, but other highlights like bright spots on faces and oversaturated colors need to be toned down. The Highlights slider can help tone down these bright spots. If the Highlights slider doesn’t have much effect, try using the Whites slider. Using a combination of these two sliders in Lightroom will reduce the bright spots in your image. One of my favorite Lightroom sliders is Clarity (also called Mid-Contrast in Aperture). This slider affects midtone contrast, which often improves many of my images, especially landscapes. Slowly pull this slider to the right and watch what happens to your image. Edges get sharper, contrast increases, and landscapes start to really jump off the page. But Clarity can have a bad influence on portraits and skin tones. Skin doesn’t look good when you go overboard with the Clarity slider. If you still want to add Clarity to your background, then use the Adjustment brush to selectively add Clarity where you want and not on your subject’s skin. Vibrance is like Smart Saturation, adding Saturation where the software thinks you need it and leaving skin tones unaffected (unless you add a lot of Vibrance). I generally bump up my Vibrance on all my images—it just looks better. This tool is invaluable for adding Saturation to blue skies, while not making things look unrealistic. And if you want to add some Saturation to your background, but not give your model a sunburnt look, Vibrance is the tool to use. 7) Add A Touch Of Saturation. Here’s a common question: Why does the image on my camera LCD look so good in the field, but when I open the shot on the computer, everything looks so drab and flat? The reason is because many photographers shoot in RAW, and the camera LCD image is a JPEG preview of the underlying RAW image. If you have your camera set to strong saturation and contrast, these settings are applied to the LCD preview image. To get the same look in the computer on the RAW shot, we need to adjust the image, including adding Saturation. I generally add just a small amount of Saturation to my images. As with Vibrance, Saturation just makes things look better. Sometimes I add a lot, especially with landscapes shot in overcast skies. With portraits, I may not use Saturation, especially if it turns the skin tones orange. Not all glass is made equal. No matter what brand or how expensive, lenses will perform great in the middle apertures like ƒ/8 and perform less well wide open or fully closed down. Lens issues such as light falloff in the corners or pincushion distortion can occur. To correct them, I use Lightroom’s Lens Corrections. This employs a preset lens profile for the exact lens you used on the shot. These profiles are constantly updated as new lenses come out. Instead of manually fixing vignetting, it’s much easier just to click the Enable Lens Correction button. Your shot instantly gets fixed!